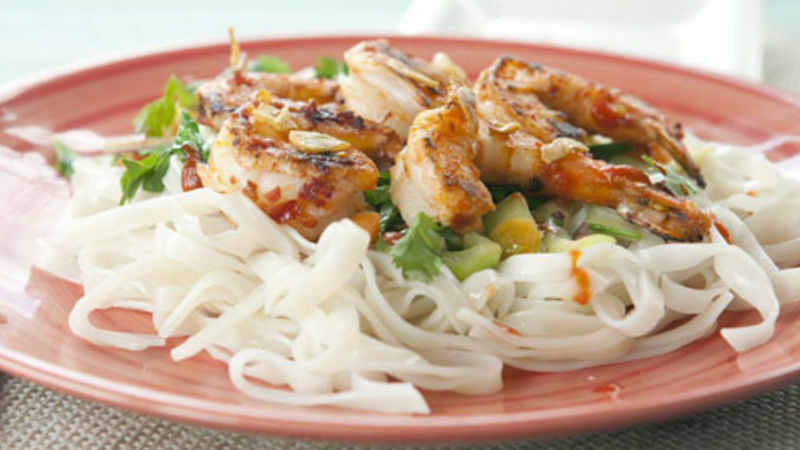 Peel and clean the shrimp and then toss them with one tablespoon oil and one tablespoon chili garlic sauce. Let marinate for at least 15 minutes. Prepare all your veggies: Chop bok choy, red onions, and shred carrots. Mince the ginger and slice garlic into thin slivers. Cook rice noodles according to package. When cooked, drain, rinse with cold water, and toss with sesame oil to prevent sticking. Add shrimp to a large skillet and sear over medium high heat for 3 minutes per side until shrimp are just cooked through. Remove from pan and wipe pan clean. Add 2 tablespoons oil to a large skillet or wok over LOW heat. Add garlic slivers only and cook for 5 minutes until garlic is starting to brown and crisp. Remove from pan. Add onions, ginger, and carrots to the pan and cook until veggies start to soften over medium heat, about 5 minutes. Add bok choy to pan along with soy sauce and lime juice and cook until bok choy wilts slightly. Add shrimp back to pan just to reheat. Reheat noodles either in a pan over medium heat or in a microwave in 30 second bursts. Serve veggie mixture over noodles topped with five shrimp per serving. Garnish with garlic chips and extra soy sauce and chili garlic sauce. Serve immediately! It’s National Garlic Day – also known as Only Kiss People Who Eat the Same Thing as You Day! Garlic is one of my favorite flavors, so for my Dragon Garlic Shrimp recipe I pack in the garlic flavor by marinating the shrimp and topping it with some crispy garlic chips. I recommend getting large shrimp for this dish. I like to use the 15 shrimp per pound range and you’ll need about five shrimp per serving. So if you’re feeding four people, you should plan on 20 shrimp. If your shrimp aren’t already cleaned, just peel off the shells and then run a paring knife down the back of each shrimp to remove the vein. Be sure not to cut all the way through the shrimp. Once your shrimp are cleaned, toss them with a tablespoon of oil and a tablespoon of chili garlic sauce. Let this sit for 15-20 minutes to marinate while you prep the other ingredients. Once your shrimp have marinated, add them to a large skillet or wok over medium-high heat and sear them for about three minutes per side. That should be enough heat to just cook them through. Remove the shrimp from the pan and wipe it clean. Now you can cook your other stuff! Maybe you noticed that I didn’t put any actual garlic in the marinade for the shrimp. That’s because it would just burn on the high searing heat. Instead, take about four cloves of garlic and slice them very thin. I also minced up some fresh ginger. Besides those flavors, you’ll need a chopped red onion, some shredded carrots, and some bok choy. I like the baby version, and recommend just rinsing it well and then chopping it up. Add your skillet or wok back over LOW heat and add two tablespoons of oil. Add your garlic slivers and cook them for about five minutes until they start to brown and crisp slightly. Not only do these garlic chips make the perfect garnish but they also flavor the oil in an amazing way. Remove the garlic from the pan, leaving just the oil and add the onions, carrots, and ginger. Cook this mixture over medium heat for about five minutes until the veggies soften. Then add the bok choy, soy sauce, and lime juice and cook until the bok choy is wilted, about 3-4 minutes. You could serve this over rice, but I think rice noodles are better. Just cook them according to the package and drain them. If you aren’t serving them immediately, rinse them with cold water to stop the cooking. Also, toss them with some sesame oil to keep them from sticking. When you’re ready to serve, reheat the noodles in a pot over low heat or in the microwave in 30-second bursts. Add the shrimp back to the skillet with the vegetable mixture just to reheat them and then stack everything on a plate. Garnish the whole thing with some of the crispy garlic chips and fresh cilantro. The dish will ward off vampires like you wouldn’t believe! Nick thinks you could use chicken or tofu in place of shrimp. Be sure to check out his blog, Macheesmo, and follow him on his Tablespoon Profile.